Easy Word Finder software helps you to quickly locate Urdu meanings of any English word in any software or webpage. Just select your desired English word with mouse and press Hotkey (Ctrl + K). Urdu meaning of that word would pop-up instantly. InPage to Unicode converter software helps you to convert InPage Urdu documents to Unicode standard quickly and easily. So this text can be used in MS-Word, PowerPoint, Excel, Websites, Databases, UNIX, Apple, Smart-Phones, Tablet PCs and all other systems. 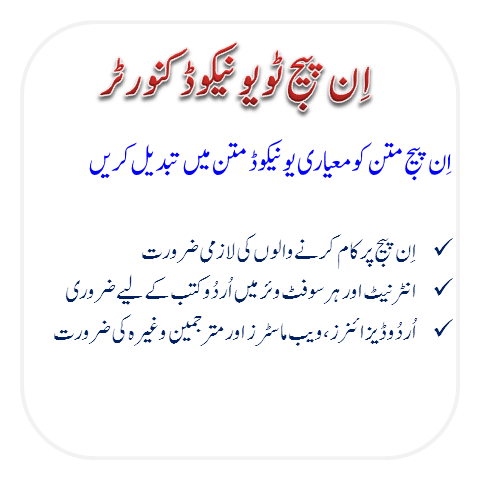 Unicode to InPage Converter software helps you to convert Unicode standard documents to InPage Urdu quickly and easily. Because InPage Urdu is the market standard of printing, publishing, news & media so this software is a must have tool for all persons and departments related to Urdu language. 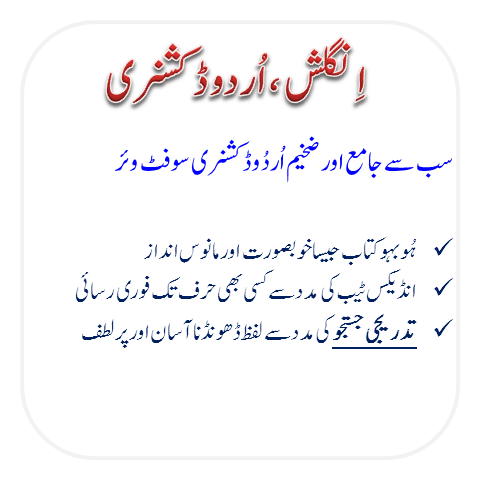 English to Urdu Dictionary software is the most comprehensive and giant electronic dictionary for windows PC. Its index makes it easy to find a word. Incremental search is a gift for typing less and finding quickly. Real book like design of English to Urdu Dictionary looks beautiful. ShairNigaar is well through beta testing stage. Release version will be available soon.